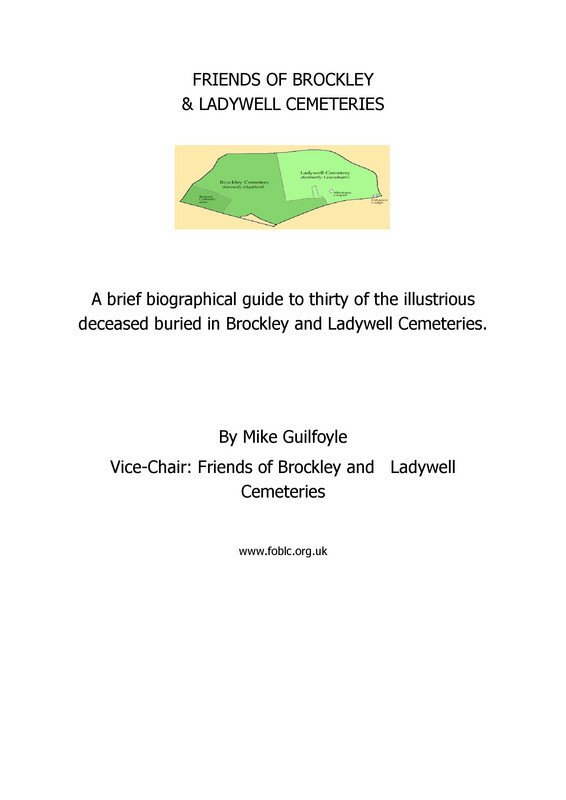 Continuing our series on the remarkable people buried within the Brockley & Ladywell Cemeteries, we are very grateful to Brockley resident and amateur genealogist John Luke who has researched the remarkable story of Elizabeth Watkins, who is described on her gravestone as a 'Waterloo Veteran' though she could only have been five years old at the time of the battle. Having come accross her gravestone during a FOBLC guided walk, John set out to find out more and here are the results. As Elizabeth’s death is recorded on her gravestone as May 1904, the first port of call was the 1901 census. This revealed an Elizabeth Watkins living in Norwich - a widow aged 91 (living on her own means), born Beaminster, Dorset. Also recorded as living at the same address was her daughter Emma Butterfield (aged 59) and Emma’s own daughter Nellie Ives Butterfield. A servant was also present, indicating that the family were clearly living a comfortable existence. The gravestone in Brockley & Ladywell cemetery also records an Emma Butterfield being buried in the same grave plot, so this was a clear indication that I had found the right family. However, Norwich is a long way from south east London and further confirmation was obviously required. Next, I consulted the 1891 census. This revealed the same Elizabeth Watkins (widow, aged 81, born Beaminster) living in Florence Street, Deptford. Her presence in Deptford at this juncture in time strengthened the case that I had the correct family. She was living with her 18 year old granddaughter Laura Ives. In the 1881 census, Elizabeth is living at the same address, this time with her husband James Watkins (a superannuated excise officer) aged 68, born in Devizes, Wiltshire. 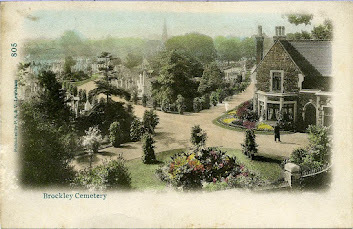 This was the final confirmation needed, as her husband James who died in 1887 is also buried in the same grave plot. He was the first member of the family to be buried there and this was obviously when the plot was first purchased. The 1871 census records Elizabeth and James as still living in Florence Street, Deptford. In 1861 they were also in London but living in the east end in Stepney. Their 18 year old daughter Elizabeth and 7 year old son Amos were also present. In 1851 they were living in Newbury, Berkshire with a whole raft of children: George Thomas (aged 15), William (13), James (11), Emma (10), Elizabeth (8), Evan (6), Henry H (4), Jabez (2) and Enoch (5 months). The Henry H is presumably Henry Hargreaves Watkins who is also buried in the same plot in the cemetery. The 1841 census finds Elizabeth in Bridport, Dorset, close to her place of birth. Her husband James and children George, William, James and Emma are all present. So it was possible to establish via the census returns that I had the correct family and to trace their movements back over the decades as far as the west country where Elizabeth originated from. However, it was necessary to reach back a further 26 years and consult some different types of record to try to establish the Waterloo connection. Firstly, it was necessary to discover Elizabeth’s maiden name – all the records so far had recorded her under her married name of Watkins. I obtained a copy of the birth certificate of one of her children (Henry Hargreaves Watkins) and this gave her maiden name as Gale. Therefore, this was presumably the surname of her soldier father. ‘Elizabeth Watkins, of Norwich, born 31st January 1810 at Beaminster, near Bridport. Her father, one Daniel Gale, was pressed into the King’s service just before Waterloo. Gale’s wife and child followed him to Brussels and were in the women’s camp near the field of Waterloo. The child remembers cutting up lint – saw many dead, and some stirring incidents of the battle’. The author was a little vague about the original source of the information but it apparently appeared in the Notes and Queries section of the Morning Post newspaper dated 5th December 1903. This would have been a five months before Elizabeth’s death and implies that she was interviewed by the newspaper. I have not yet checked the original source. ‘In October last I had the honour of bringing under the attention of His Royal Highness the Duke of Cambridge the case of an old Waterloo soldier named Daniel Gale, who resides at Beaminster, in Dorsetshire, and who has now reached the advanced age of 90 years, for whom I had sought some slight relief’. From the remainder of the letter, it would appear that Daniel secured his benefits. The Battle of Waterloo is so extensively documented that it is possible to form a picture of how Daniel and his unit fared that day. The 95th Foot were a rifle regiment who had three battalions (or parts thereof) present at Waterloo. They were lightly equipped infantry who wore rifle green rather than the traditional red tunics of the line infantry and they had a somewhat enviable status within the army for their efficiency and discipline. Their role in battle was chiefly skirmishing and reconnaissance, however the 3/95th were not deployed in this fashion at Waterloo – they fought as conventional line infantry. The 3/95th were also not a full compliment – they only consisted of two companies (one source giving their numbers as only 205 officers and men). They formed part of Major General Adam’s 3rd (British) Brigade. One could imagine that Daniel may have considered himself more fortunate than many of his fellow soldiers on that day. The 3/95th were initially held back in reserve some 700 metres behind Wellington’s front line and were not committed to the front line until late in the afternoon (the battle had already been under way for a number of hours). However, everything is relative and they formed part of Wellington’s defence of infantry squares in the face of the massed French cavalry attacks that occurred at this phase in the battle. This onslaught continued for two hours before abating. The 3/95th were left in an exposed position and were subsequently pulled back to a position of relative safety on Wellington’s right wing behind the chateau of Hougoumont. Napoleon launched his Imperial Guard in one final attempt to smash through Wellington’s right centre. The attack was repulsed. The 3/95th are likely to have been involved in this action but because of their position on the far right, they would have probably contributed to the flanking counter attack on the French infantry columns. Napoleon’s army fell into retreat and the 3/95th would have been part of the general advance ordered by Wellington to press home the victory. So Elizabeth, her father and, by inference, her mother (Mary?) all survived to tell the tale. A Daniel Gale, aged 57 appears in the 1841 census in Beaminster with his wife Mary and daughters Mary (18) and Jane (13). There is no indication that he is a former soldier but the age and place fits. He may simply have returned to his civilian occupation on leaving the army. In 1851 he is a widower and appears to be residing with his married older daughter Sarah. This is also the case in the 1861 and 1871 censuses. Sarah’s age identifies that she was born in 1805 – before Waterloo – though there is no evidence as yet that she was present with the others at the battle.There is an entry in the death registers in Beaminster in 1876 for a Daniel Gale aged 93. This ties in closely with his age as recorded in the Times article, so could well be him. There is scope for more research on the Watkins family and on Daniel Gale. There is a fair chance he may be found in the muster rolls and pay lists and the in the description books for the 3/95th held amongst the War Office records at the National Archives. I will investigate this further when I can find the time. Whatever the case, we now know something of the small part that Elizabeth and her family played in one of the momentous occasions in British history. We can also imagine how large it must have loomed in her consciousness and in that of her family for it to be so prominently commemorated on her gravestone nearly a century after the event.